One year after the Cuban flag was hoisted above its embassy in Washington, D.C., Havana remains one of the least connected global capitals as Raúl Castro’s government continues to block internet access for most on the island, a senior State Department official said Wednesday morning. While the Obama administration has eased restrictions on telecommunications companies hoping to penetrate the Cuban market, Havana has been slow to reciprocate, the official told reporters during a conference call. "In terms of the connectivity, obviously that’s something that we would like to see move more quickly," the State Department official said. "We’ve taken action on our part to facilitate potential business with U.S. telecom and Internet companies." The official said the Obama administration has nearly exhausted the steps it can take in Cuba through executive authority. Any substantial changes going forward will have to be implemented by Congress or the Cuban government, which the official suggested has done little to match the United States’s efforts. The Cuban government remains fearful that opening up the internet to its people would lead to a slippery slope of U.S. influence over the island. Havana still bans residents from setting up home internet connections and censors opposition sites it considers threats. Four months after President Obama’s historic visit to Cuba, estimates show that fewer than 10 percent of the island’s more than 11 million citizens have access to the internet. The State Department official noted that Castro’s government has "made commitments" to broaden internet access and reduce costs, but substantial improvements have yet to be seen. "Certainly from our perspective, we would like to see the Cuban government move more quickly to meet the demands of the people for this greater access and greater connectivity, but in the end that is going to depend on actions taken by the Cuban government." During the past year, the Cuban government has expanded access across the island, adding over 100 internet access points, allowing public Wi-Fi for the first time, and reducing the cost for internet access, according to Freedom House, a nonprofit organization that promotes human rights and democracy. The State Department official suggested the changes have been mild, noting that many of the hot spots are overwhelmed, connections remain slow, and Cuban residents, many of whom earn between $20 and $30 a month, are unable to afford the nation’s expensive access. In downtown Havana, crowds of residents attempting to connect to the internet cluster outside hotels that have Wi-Fi service, while others gather in public parks and sidewalks. 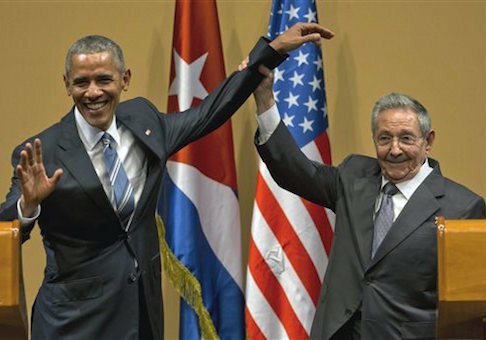 The official said the administration remains "convinced" that the United States’ "shift from a policy of isolation to engagement is the best course for supporting the aspirations of the Cuban people, an emergence of a peaceful, prosperous, and a democratic Cuba" despite sluggish improvements since Obama announced the United States would normalize relations with its Cold War enemy in December 2014. "I think the benefits of that policy are becoming clearer over the years," the official added. "I would never speculate on what a next administration may do, but I think the extent that this has yielded these positive results for the United States for the Cuban people, it would be difficult to go backwards." This entry was posted in Issues and tagged Cuba, Raul Castro. Bookmark the permalink.